This species is accepted, and its native range is Bolivia to NW Argentina. Tree up to 15 m or occasionally a shrub 2.5–3 m tall. Leaves bipinnate with 13–31 pinnae each with 13–41 sessile leaflets which are elliptic or oblong-elliptic, 3–12 × 1–4 mm, but terminal leaflet can be up to 25 × 7 mm. Calyx campanulate, 3–4 mm long with teeth ± 1 mm long. Corolla purplish blue or lilac, the tube white inside, basal part almost straight, upper part funnel shaped, 3–4 cm long with lobes 3–8 mm long. Fruit round, 3.2–6 × 3.7–6 cm, strongly compressed, woody. Seeds including the surrounding wing 9–17 × 11–17 mm. Williams in U.O.P.Z. : 313 mentions J. caerulea (L.) Griseb. Stating ‘there are a number of young trees in Zanzibar town which have flowered but sparingly’. There is nothing in the information given to suggest this is a correct identification. A native of the West Indies, J. caerulea differs widely from J. mimosifolia in its oblongelliptic, ± obtuse leaflets (0.5–)1–2 × (0.3–)0.5–1 cm and more elliptic fruit. 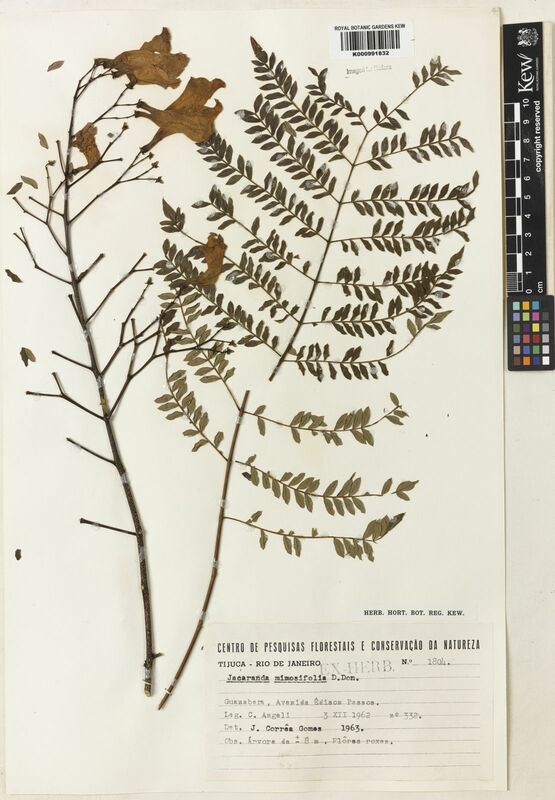 It is, however possible that the original determination is correct since it is likely a West Indian species would be thought to be more suited to Zanzibar climate than J. mimosifolia but there is no record of it being cultivated anywhere outside America. Cultivada en Colombia; Alt. 1500 m.; Andes. Widely cultivated in East Africa in gardens and as a street tree. Argentina Northeast, Bangladesh, Canary Is., Cape Provinces, China South-Central, Dominican Republic, East Aegean Is., Ecuador, Gabon, Gambia, Haiti, Hawaii, Jamaica, Juan Fernández Is., KwaZulu-Natal, Leeward Is., Madeira, Mexico Central, Mexico Gulf, Mexico Southwest, Northern Provinces, Puerto Rico, Spain, Swaziland, Trinidad-Tobago, Venezuelan Antilles, Windward Is. E. Afr. ed. 4, p. 331 (1957) as J. ovalifolia R.Br.